So often we commemorate the day or memorialize an overwhelming mass tragedy, but lose sight of the individuals, the moments in time, the instances that change our world. 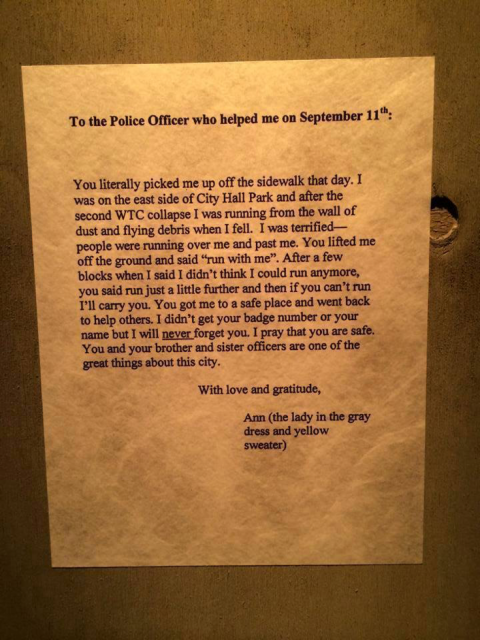 The below letter, written to a 9/11 survivor, to the police officer who saved her that day, could easily go out to any Officer in the field today. In instances each and every day, they give of themselves selflessly, without hesitation, in the face of fear. Alongside members from each of the various emergency services - they reacted, without thought or hesitation, in service to others, as each of them do every day across this great land, and the world. Whether it be another 9/11, North Hollywood or Newtown, they’ll be there. Whether it be as simple as assisting a lost child, or an elderly victim, they’ll be there. They are sinner and saint, neither perfect nor flawless, but…they are there…for you, and without reservation; for no other reason, than that of being a product of necessity; To silence the panicked bleating, to give comfort in the face of evil. Not special, just different. We stand alongside the officers for all they did on 9/11 and all they are willing to do at any moment in time. Some, as I, have dreamed of this as a small child, a “calling” by which they had no other choice. Others have matriculated to a place of service later in their days; nevertheless, they all share a common goal. We are all, that still small voice saying, “just run a little farther”. We are all, that “protector” from things that go bump in the night, and we are all the thin blue line, standing between those who would choose to alter your way of life. From NYC to LA and everywhere in between, we are the police. We are all Americans and each of us equally capable of protecting and defending our way of life. Honoring who we are, and ensuring we remain, by teaching the youngest among us those values by which make us great. Equally created. Endowed by our creator. They are the children of America. They are freedom's ring and we are the greatest nation. Love her, share her; and in your own way, each day, do the small things that define you, her and us.